Internet, I LOVE you! It's been a long few days without it. I'm all moved into our new flat and it is the best house I have ever lived in! It's about three times bigger than my shoebox old one and there's so much more to do! Mostly because the garden is a mess, but it's great. I'm so happy at the moment! I managed to make another tutorial while I was internet-less and I looove this one :). 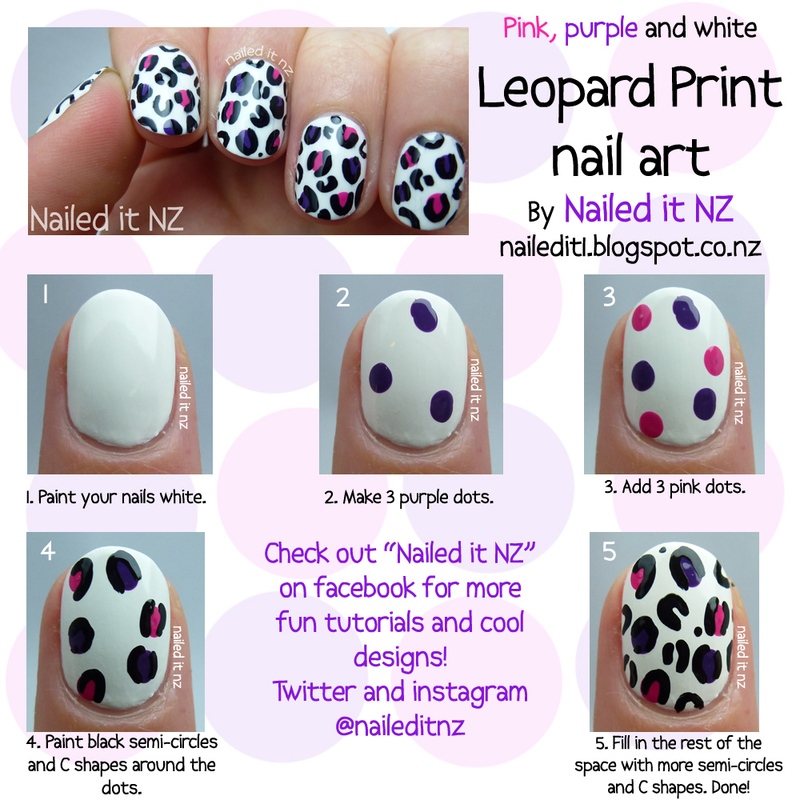 I have quite a specific way of doing leopard prints; I like the spots to be small and to have some colour mixed in with the print, like it is in this tutorial. I haven't actually done a natural leopard print yet - although if I used a grey instead of pink and purple here it could have been like a snow leopard. I was careful making this so it'll be hard to crop my watermarking out. I get so angry when people do that. Recently my tribal nail art tutorial was mutilated by an awful facebook group that has over a million likes! They replaced all of the writing with their facebook name :(. I think facebook will end up deleting their page though, they're constantly being reported - they're only famous from stealing other people's work! I'm going to make a post about this soon, but I should make it clear that it is completely illegal to copy pictures, and even worse to claim they are your own. Share them, instead! All you need to do is post a link to the original artist's post, or tag them on facebook. Don't know the original artist? Google search their water mark. If there is no watermark you can still try find them by searching by image. I respect people who credit me and will often follow them just because I like them. Of course, I won't be able to do this forever but at the moment I try! 3. Either Candy Land or Star Dot Com (which would you prefer?) by Jindie nails. 3. $10 worth of nail art supplies from Born Pretty Store (I'll be buying these myself). If any other indie polish makers want to sponsor the giveaway let me know asap! My email address is in the "contact me" tab. As always, if you do this tutorial make sure you take a photo and post it to my facebook page! If you have a blog and have done these nails (or another of my tutorials) you can post your link too, as it's actually related to my blog. In my new house I have a nail art room - finally! It's honestly the most amazing thing I've ever had. I'm going to take photos and videos of it soon once it's completely set up. Hope you all like the tutorial! but this is so cute! I love mixing up the colours :). Thanks! Great tutorial and it looks very good! I can never get the leopard print look quite right! I will definitely be giving your tutorial a go! Your colour scheme is gorgeous too. Oh, I adore your leopard nails. So gorgeous. Kisses. I think I'll try this. For me leopard print seems easy in theory. But when I actually try it always looks horrific! Hope it turns out well for you!